We are one church in five locations. Our Virginia Beach locations at Oceanfront, Town Center, and Princess Anne as well as our campuses in Downtown Norfolk and Stuttgart, Germany, each bring a unique dynamic to Trinity as a whole, just as Trinity brings its own dynamic to the church at large. Join us this Sunday at one of our locations and be a part of our Trinity family. Engaging programs for children from birth to fifth grade are available at all of our locations during the services. When you visit, please stop by our Connect Center after the service. We'd love to meet you and to give you a gift to thank you for joining us. Trinity's newest campus launched in September 2018 at Nauticus Naval Museum. Park at the Town Point garage and bring your ticket for validation to receive free parking. Coffee and pastries are available before and after the service. Click herefor maps, directions and further contact information. 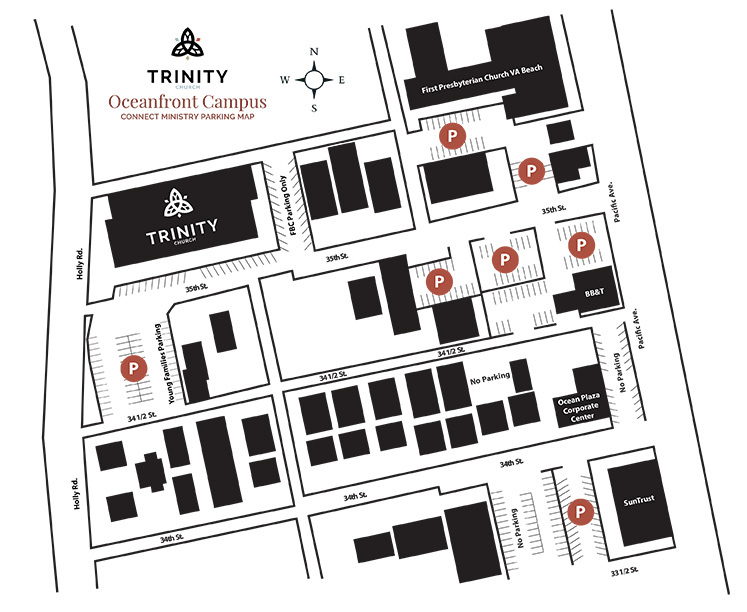 *NOTE* Trinity Church shares parking at the Oceanfront location with not only First Baptist, but many beachfront residences. Please review our parking map here to know where to park and to avoid being towed. Click here for maps, directions and further contact information. Trinity Town Center meets at the sky-scraping Westin Hotel. It is our pleasure to serve a coffee & a snack before worship in the second floor ballroom. *NOTE* Please do not park in any spaces that are marked with red lines as these spaces are reserved for the Westin guests. After you park, hop on the elevator and push the button for the ground floor to enter the hotel lobby. From the lobby, follow the signs up to the elevator or stairway to the 2nd floor ballroom. Trinity Princess Anne meets at the Princess Anne YMCA Family Center. It is our pleasure to serve coffee & a light snack in our Cafe before our worship service.